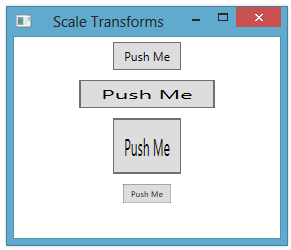 You can use a scaling transform to scale a user interface element in the X or Y dimensions. Scaling an element increases or reduces its size. You can specify separate scaling in the X and Y dimensions. A value of 1.0 represents the normal (not scaled) size of the element. Scale values larger than 1.0 increase the size of the element and values less than 1.0 decrease its size. You specify scaling using a ScaleTransform element, setting values for the ScaleX and ScaleY properties. If you don’t supply a scale value for one of the dimensions (X or Y), a value of 1.0 is used.